The fundamental message of the speech and of the days events, that Syria should not be bombed by UK military forces, is one that I support, but the narrative surrounding Syria and the question of bombing, contains an untold number of lies. Whether Tariq Ali is genuinely so ill-informed as to believe what he says, or whether he is deliberately pushing a certain narrative, is a question for another time. What we are here to look at are the falsehoods, or lies for want of a better word, that Ali espoused as truth. Michael Weiss and Hassan Hassan, authors of the best selling book ISIS: Inside the Army of Terror, recently had an extract published on Business Insider under the title: “Why some secular Sunnis support ISIS”, the keyword here being “some”. Rather than their being “mass support” for ISIS, as Ali said, Weiss and Hassan state: for some “ISIS is the only option on offer for Sunni Muslims who have been dealt a dismal hand in the past decade”. A last resort more than mass support it seems. This last resort policy is something that is echoed in a 2014 piece written by Lucy Fisher for the New Stateman. Here she states: “As Isis has overrun great swathes of Iraq in the past two months, it has frequently received complicity” with the Sunni dominated communities that live there extending “sympathetic reception to the insurgents.” The reason for this complicity and sympathy, again hardly “mass support”, is because of ISIS’ promises and appeals to the disenfranchised and “downtrodden and insecure communities”. The article goes on to list the numerous reasons as to why these communities feel so disconnected in the first place. An Independent article, published at the start of October, brings attention to the fact that Iraqi authorities are now in discussion with Sunnis in order to secure their support in the fight against ISIS. These are the second such talks to have taken place if its true that “significant progress” occurred, then once again it seems to contradict Ali’s statement regarding “mass support”. One of the few sensible and entirely accurate statements that Ali made in the video. He is correct about this, but after stating such a thing, does not then go on to mention the fact that Assad played a major role in creating the conditions needed for ISIS. Instead he attributes it solely on Western intervention, which certainly did not help the situation. By blaming Western intervention alone, he is deliberately omitting the vast number of crimes committed by Middle Eastern dictators over the last decade and beyond. Focusing on Assad, there are countless sources that document the role he and his regime had in the creation and the rise of ISIS. In the post 9/11 years, before ISIS split from Al Qaeda, Syria was the main conduit through which extremists travelled to get to Iraq. Some 90% of foreign Jihadists fighting for Al Qaeda in Iraq had come through Syria. As early as January 2008, US intelligence officials were warning Assad that the returning Al Qaeda fighters “pose a threat to the Syrian regime” and that “Syria will be an AQI (Al Qaeda in Iraq) target in the future”. If this weren’t enough there is also substantial evidence linking prominent figures within ISIS with the Assad approved Sednaya prison inmate release in 2011, and it is also widely reported that Assad purchases oil from ISIS held oil fields. Business Insider reported on these issues in January 2015, The Telegraph in that same month, The National in January 2014, Al Jazeera in that same month, Politico in June 2014, Newsweek that same month, The Wall Street Journal in August 2014, Der Spiegel in October 2013, and it goes on. If the CIA/Pentagon source that this information came through was correct, which wouldn’t surprise me, then it still does not change the fact that uprisings against the Baathist Assad family and regime occurred in Syria long before we in the West even debated bombing the country. “Mass activity” and rebellion against the Assad family rule has been conducted for decades. Most notably in 1982 during the Hama Uprising which was brutally subdued resulting in the deaths of between 20,000 – 40,000 civilians. Though Ali is correct in saying that the Russians are bombing ISIS, as they are, especially after the Sinai plane incident, what is again noticeable by its absence is the fact that he makes no mention that the overwhelming majority of Russian bombing is not attacking ISIS, and it is in fact aimed at anti-Regime rebels across the country. At one point in his speech Ali proudly states, “I no longer read The Guardian”, but it seems he no longer reads any news, because the Russian bombing of Syria is another issue that has been widely reported, but has apparently missed his attention. 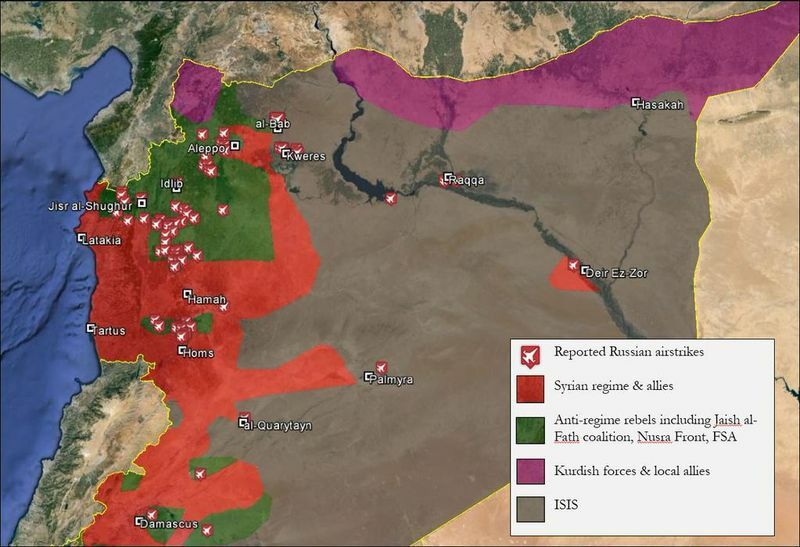 There is simply so much evidence that I am unable to present it all here, but I will include a map of Russian airstrikes in Syria up until the 7th of October. Created by The Levantine Group and published by Vox, it shows just a small percentage of Russian strikes targeting ISIS positions. Once again, many media outlets have commented on these Russian bombing campaigns, a handful of whom are The Telegraph, Vox, Reuters, The Wall Street Journal, The Daily Mail, The New York Times, and Al Jazeera. (Again, the list goes on). Or if you wanted to see video evidence, here are Russian bombings in Idlib, in Homs, in Damascus, in Hama, and near Aleppo. Now I have given this some thought and I believe that Ali is calling Cameron’s bluff here. Considering the event was hosted by Stop the War Coalition, I don’t believe that Ali was actively advocating working with Putin and Assad to defeat ISIS militarily in Syria. His argument was that if Cameron’s real aim is to defeat ISIS, then logically he would have to work alongside both the Russian and Syrian leaders. However, as we have pointed out previously neither of these seem overly concerned with ISIS at present, focusing more on anti-Regime rebels. With this being the case Ali’s argument falls flat, as to defeat ISIS currently it seems you must oppose Assad and the Russians, not join them. Ali is again correct in saying there are a number of wars taking place, but once again he is far too simplistic, and ultimately disrespectful to the various fighters who cannot be classified as either Al Qaeda or regime forces. To dilute the conflict to this level is utterly ridiculous, and it is at this point in his argument that you understand why so much of what Ali previously said was untrue. Quite clearly he knows very little about what is occurring inside Syria and fails to acknowledge that there are more than two primary actors. Al Qaeda are present in the Syrian conflict, under their Syrian wing Jabhat al-Nusra, but so too are numerous other groups. There is the Southern Front, Jaysh an-Nasr (Army of Victory), Ahrar ash-Sham, Jaysh al-Islam, Jaysh al-Fatah (Army of Conquest), the Northern Storm Brigade (whom I met in 2013), Free Syrian Army forces in Turkmen (whom I met in 2013), the Sham Legion, the Levant Front, and the list goes on. Those who stand opposed to the Assad regime and his backers, form a complicated web of regional divisions and brigades that merge and shift depending on the military campaigns to be conducted. Jabhat al-Nusra, and thus Al Qaeda, are just one string of this web. Another untrue statement made by Ali, but seeing as he only believes there are Al Qaeda and regime forces battling it out, then it is understandable as to why he thinks it would be impossible to find 70,000 fighters who are not intent on cutting westerners heads off and posting the videos on YouTube. Blogging for The Spectator, Charles Lister does my work for me here, explaining how such a figure is in fact accurate. His calculations result in a figure of 75,000 “liberal” fighters, with tens of thousands more being considered Islamic conservative. After speaking for roughly ten minutes on the issue, Ali concludes that he has adequately and accurately represented the conflict in Syria. You would be pushed to find a more shallow and misinformed narrative anywhere else, so my advice is not to listen all that much to Ali’s summary of the situation. With that Ali then proceeds to shift the focus away from “the worst humanitarian crisis since the Second World War” and instead decides to use the stage and the event to talk about the “war” being waged against Labour leader Jeremy Corbyn. If ever there was a time to do such a thing, it was not at a rally to oppose military intervention in Syria. Shifting the debate on to Corbyn is hugely disrespectful to the 300,000 or so dead and the millions more who are internally displaced or who have fled the country. Corbyn and his media issues are another topic, for another time. When I first wrote this, 24 hours or so ago, there was one notable omission from the various media outlets that I sourced material from. Right on schedule, as if by magic, here is The Guardian with a piece on Syrian exiles who had fled Raqqa. Al Jazeera then published this piece entitled Debate about Syria is missing one thing: Syrians, speaking with Syrian research Samer Abboud. “While there seems to be international consensus around confronting ISIL and in the utility of military force to do so, the growth of the coalition fighting ISIL to include Russia, France, and potentially Germany and the United Kingdom, is not a positive development in the Syrian conflict. The expansion in the number of countries bombing Syria further internationalises the conflict and creates more layers to this already complicated and multilayered conflict. Most troubling, however, is that the increase of Western involvement in Syria shifts the conversation in the West about the Syrian conflict further away from the realities on the ground towards a framing that is remarkably consistent with that of the Russians, Iranians, and the Syrian regime, mainly, that this is a conflict between the regime and ISIL and the rest of the groups are essentially bystanders. 04/12/15 Jacobin has published this exceptional piece on the rise of ISIS. Note the tremendous role that Assad, his regime, and their actions have. If you think that is Britain’s only course of action, then you are mistaken. I understand plenty disagree. But personally, I am fed up with Islam. I think that if possible, we should stay as much out of Islam as possible. Putin wants to exterminate ISIS, lets let him. Well I am sure Islam is fed up with people like you as well, so I guess you should just keep your thoughts to yourself from now on. Why is it the West’s job to solve everything? They often state foreign policy as a factor contributing to terrorism. Regardless, we should leave these people to their own problems, Putin can decide. Putin has no place bombing the Middle East, just like us. “These people” would decide their own future if Russia, Iran, and Hezbollah weren’t propping up a war criminal. Excellent piece. I must get hold of your book. Tariq may be “skilled and intelligent” but , as someone who knows him of old, he has always been intellectually lazy and sloppy . (He once said that he relies for a lot of his knowledge “on his friends” ) He fell for both of the big Syrian disinformation stunts – over the Houla Massacre and the Ghouta Chemical weapons attack, and eventually had to back off on both of them (I think he spoke to some better informed friends) – although in the latter case only so far as to say “we don’t know” who was responsible for the Ghouta attack. There is a striking lack of originality in this speech, Roland Dumas and Wesley Clark trotted out as witnesses – two perennial tales of the conspiracy theorists.I don’t know if you are familiar with Clark’s story ( http://www.globalresearch.ca/we-re-going-to-take-out-7-countries-in-5-years-iraq-syria-lebanon-libya-somalia-sudan-iran/5166) but it refers to a conversation between him and a senior Pentagon official in 2001, at the height of neo-con influence in the George W Bush administration. Those who use it rarely note that Clark’s confidant was horrified by these plans – as were most members of the established US policy bureaucracy. Clark refers to what went on in this period as a “policy coup” by the neo-cons. To believe that this scheme has lain behind everything that has happened in the middle east since, you have to believe that US policy has remained totally unaltered for more than a decade despite a change of administration, the discrediting of the neo-cons, the hostility of of the mainstream policy community, and the debacles of the Afghanistan and Iraq adventures. But these are subtleties that would not detain Tariq. He also repeats his own oft-told tale of the Libyan intervention causing “20 -30 000” deaths. In the early telling he was unclear about what deaths he was referring to (civilians, total including combatants) but iater he appeared to say that it was civilian deaths caused by NATO bombing. He has offered two accounts of his source – the most recent that it came from a SOAS professor who is/was an advisor to NATO. I’ve done thorough fact checking, and no such person exists. My guess is he is channeling one of his less reliable “friends”. Sad to see someone who was once an emblematic figure of the British left descend to the status of a second-rate conspiracy theorist. Sadder still to see him misleading so many young activists who probably won’t look further than his account to discover what is really going on in Syria. Thank you for commenting. What you speak about is really useful and I am grateful for your input on this. I haven’t followed Ali as much as many others, but his StWC seems to fit into his usual habits, as you describe them. Tariq, you say critics are distorting your views and you asked them to view your October speech. I watched it carefully. In it you say once Assad tried to crush the rebellion the “left liberals, liberals, modernists” were superseded and that in March of 2011 the banners went up calling for a Sunni ruler and a religious war. “Superseded” after just one month? Armed struggle against the regime didn’t even start until July when defectors formed what they called the “Free Syrian Army”. In the rest of your speech you only talk about the internal opposition to regime as being Islamic extremists and the Kurds. The revolutionary and democratic forces just disappeared? 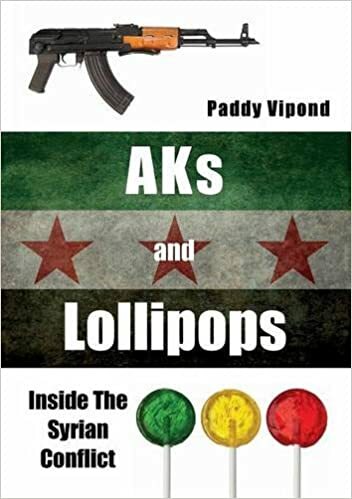 Why no mention of the pacifistic Local Coordinating Committees, the people of Kafranbel, or of the hundreds of local groups that sometimes use the name Free Syrian Army. They are facing many enemies at the same time, but they haven’t been extinguished. They deserve our solidarity. Your description of the war: “a giant conflagration in Syria – indiscriminate bombing by both sides…” as seriously inadequate. The Syrians I trust say the overwhelming number of deaths are the result of the Assad regime. It stands to reason. The regime has a standing army with every type of armament, jets, helicopters, etc. resupplied constantly by Russia and Iran and has no hesitation in using all of them. None of the opposition has anything like that. And even the ISIS didn’t torture thousands to death in prisons and photograph the results as revealed by the defector “Caesar”. You talk about the machinations of the West and no doubt are accurate about their intentions, but you virtually say nothing about Iran, its intentions and its actual acts like the blind support it has actually gives to the Assad regime. ISIS grew not only on the Western ruin of Iraq, but also out of Assad-Iranian-Russian wreckage of Syria. You say the solution is a coalition government, the Kurds the Assad forces (magically denuded of their secret militias) and “those sections of the opposition who are prepared to put the interests of the Syrian people ahead of their own narrow way of looking at things”. I don’t even have a clue about whom you’re talking in the last category, the fabled US friendly “moderate” Islamists, or the left liberal and liberal forces who you say have long ago been “superceded” or what? I support this wholeheartedly. Spot on. Assad Is A Great Man, Done Much For Syria & Is The Best Option All Around ! Traitors, Especially In military Conflict Should be Put To The Sword ! Assad is a war criminal, just like his father.